If you had been a Purdue University student about 100 years ago, you would have had the pleasure of listening to Mr. Frank Curtiss, our physical director, give you lessons. Now these lessons weren't part of any curriculum; they were just lessons in general if you happened to participate in any of the existing men's and women's recreation and athletic programs all conducted by Mr. Curtiss himself, the only gymnastics instructor on staff. Besides lessons in some sports and games, exercises with dumb bells and wands were popular among Purdue students. But Mr. Curtiss also gave lectured lessons. One of his more interesting lectures was on the subject of "How To Take A Sponge Bath." Mr. Curtiss thought that "whooping it up" in gymnastics naturally fagged (fatigued) everybody out. He thought that our corpuscles needed perking up after such exercise. So, in addition to being an advocate for taking a weekly "tub" (bath), Mr. Curtiss gave a step-by-step lecture on the how-to of a basin sponge bath after exercise, complete with the proper temperature of 78 degrees, the order of body parts to be washed from head to toe, and the likely result: "A general elevation of spirits, which proves that the combination of exercise and bathing is a natural tonic." Had you been with us about 25 years later, you would have been among the first students to take official classes of instruction in the Department of Physical Education and Military Training for Men (1922) or the Department of Physical Education for Women (1925). The men were housed in Memorial Gymnasium. Memorial was built in 1909 in tribute to sixteen men, mostly football players, who lost their lives in the train wreck of Halloween in 1903 while on their way to play Indiana University in Indianapolis. This facility was funded by popular subscription, with a substantial part of the $88,000 price tag coming from a gift from the Big Four Railroad. The new women's department was located in the old Electrical Engineering Building. In a 1926 remodeling effort costing around $20,000, space was created for two gymnasia, two offices, and a locker room. No more sponge baths as this facility also had showers. 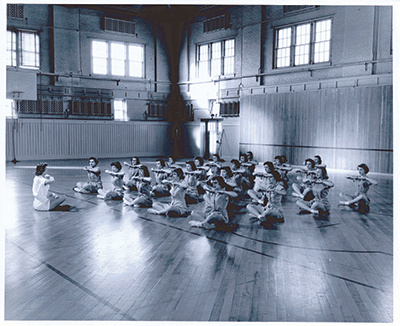 Growth in popularity and influence of both of these instructional programs, in addition to the need for improved athletic facilities, led to yet another building construction project in 1938. This new Fieldhouse and Gymnasium, as it was called then, became the new home for the men. The complex included a home for the basketball team, an excellent swimming pool, squash courts, modern offices, and an indoor practice field for football and baseball. Funds for the $720,000 project came from a Works Progress Administration grant, generous alumni donations, and a bond issue that was eventually retired from athletic gate receipts. In 1971, this facility was renamed Lambert Gymnasium and Fieldhouse in honor of Ward "Piggy" Lambert, Purdue's legendary basketball coach from 1918-1945 — and by the way, the man who also coached John Wooden when he played for Purdue. The women, meanwhile, moved into the vacated Memorial Gymnasium and remained there exclusively until we merged the men's and women's departments in 1975. Since then we have undergone a series of name changes, and like academic hermit crabs, we have all moved into Lambert, having lost Memorial Gymnasium to Computer Science in the early 1980's. We thought you'd be interested in some of our early history. The point of this lesson — since like Mr. Curtiss, we are still giving lessons — is that in one form or another our department has occupied a prominent position in the overall growth of Purdue University. Different people today, different programs of study, but our footing is remarkably solid. We are all proudly part of a tradition at Purdue that is dedicated to helping students find their calling, and once called, to help them prepare for an exciting future in any of the many lively careers related to the burgeoning fields of study in health and kinesiology. You know, when it comes right down to it, like Mr. Curtiss, it's probably fair to say that, in our own way, we're still "whooping it up!"